His name is Claudio Torresani, he was born in 1953 in Milan, now he lives in Settimo Milanese near Milan in Italy. Why "photographic hunter"? Because he feel like a "hunter", actually, he feel more like "photographic poacher". His big love for nature and animals prevents me doing evil to them. His ever-lasting challenge with animals results in a photograph. After years of birdwatching he was drawn to do naturalistic photographic art because he wanted to immortalise the animals actions, rather than see it for one moment he wanted to keep it forever. The genre he prefer to do is wild animals (in day-time and in night-time) in an activity such as in flying, running, etc. This genre can be done in 3 different ways: wander on foot or by car, or with long ambush or make "photographic traps". The equipment that he use is a Canon, Nikon and Hasselblad, 500 mm wide angle plus Photo-electric cells, remote controls and other custom made devices. 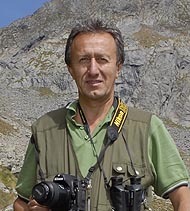 He has published his images in many prestigious Italian magazines and some special books. He had also done presentations for various photographic, naturalist and cultural associations. In the presentations he display slides and talk about the images and try to convey the emotions he felt and also increase people's awareness of the environment. l He won the world champion of naturalistic photo 2010/2011 with the F.I.A.F. 's italian national association in India to F.I.A.P. of Bengalore in the section printed images (see photo) and in the section projected images (see photo). l At the photographic competition "TROFEO IL CUPOLONE 2010" he been award a prize as “the best author”. l At the photographic competition 2009 "ISTANTI DI NATURA" he been award a prize as "absolute winner". l He won the world champion of naturalistic photo 2008/2009 with the F.I.A.F. 's italian national association in Spain to F.I.A.P. of Palma di Maioca in the section of project immage. l At the Italian naturalistic photographic competition 2008 in the section "Mammalians" he won the 1° prize (see photo). l At the International naturalistic photographic competition "ASFERICO 2008" he won the "Mammalians" category. l At the international photographic competition of Birdwatching 2007 in Comacchio he won the 3° prize in the section " image sequenze ". l At the Italian naturalistic photographic competition 2007 in the section "Birds" he won the 1° prize (see photo). l At the Italian naturalistic photographic competition 2007 in the section "Mammalians" he won the 2° prize (see photo). l He won the world champion of naturalistic photo 2006/2007 with the F.I.A.F. 's italian national association in Croatia to F.I.A.P. of Rovigno in the section of printed matter in colour (see photo).